Wisconsin Wire Works Inc. is an integrated manufacturer of copper and copper alloy welding wire. Five copper-industry veterans founded our company in 1994, and in a relatively short time, we've built an enviable reputation as a reliable supplier of top-quality, made-in-the-USA welding products. Today, our customers can be found on every continent. If there's a secret to our success, it's that we listen to our customers. We're small enough to know our customers well, and we survey them regularly to learn how we can serve them better. In return, our customers tell us they've come to rely on us for the quality of our wire, our timely delivery and our prompt, personal service. 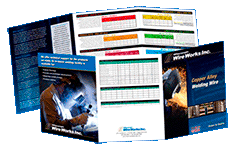 Wisconsin Wire Works Inc.'s welding consumables are made by welding professionals for welding professionals. Our facilities reflect our founders' decades of combined experience; designed for efficient economical manufacturing yet flexible enough to accommodate changing market needs. Our base stocks are purchased from well-established suppliers. Our drawing equipment is state-of-the-art, and we maintain it carefully. One small example: we rework our drawing dies on a regular schedule -- not just when they need it -- and the extra effort shows in the surface quality of our wire. Our inspection program is thorough and unforgiving. No product leaves our plant unless it meets or exceeds established quality standards for size, cleanliness and proper cast and helix. Speaking of cleanliness, our manufacturing facilities are located in a state known for its natural beauty, and we strive to be good neighbors to our environment. We select and use process materials so as to keep landfill utilization to a minimum. We use non-contaminating lubricants exclusively, and we clean all products thoroughly before shipment. Our staff of experienced welding engineers, metallurgists and fabrication specialists is ready to help you solve your welding problems. We invite you to call us for more information about our products and services. Our standard spools are precision layer-level wound to ensure smooth reliable feeding, an important consideration for automatic and robotic welding applications. Products are available in all popular U.S. and international weights on spools, straightened-and-cut lengths, reels, coils and economical barrel packs. We use only robust cartons incorporating hermetic moisture barriers to guarantee good appearance and long shelf life. International shipments are boxed for safety and security. it's that we listen to our customers.